A tall reddish-fawn baldfaced ewe with white socks. This is a really diverse pedigree, incorporating genes from Iowa (Thistle Grove), Ohio (Misty Oaks), Illinois, (Whitepost Farm, now retired) and Montana (Aspen Mountain). 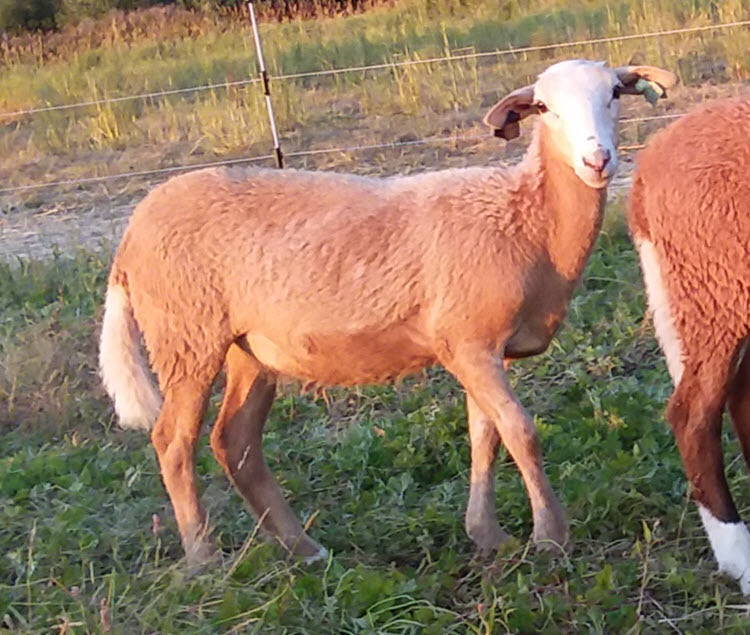 Very solid growth and milk numbers and moderate prolificacy, this girl may help avoid triplets for those who don’t like them, but should be a solid twinner that can reliably raise good lambs. EBVs from the 2018 lamb crop 120 day weight data. Photo taken in mid July. This ewelamb tested pregnant in Feb.